This bathroom is so spacious and light-filled. I love the way the countertops to the bathtub appear to be one seamless piece of material. The next best thing to a pool? Feeling like your outside while actually sitting in the air conditioning. This terrarium like space below is inspiring and beautiful. 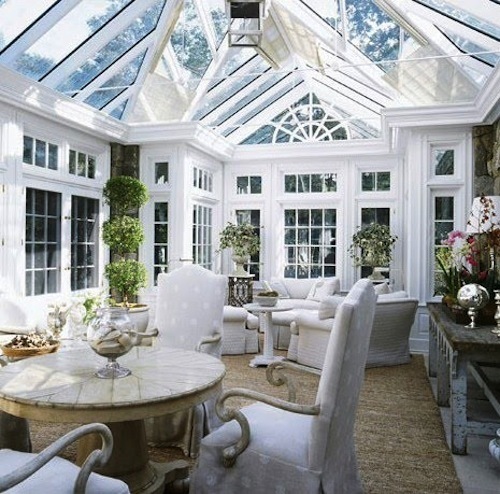 These rooms are stunning - I love the clean white! I am absolutely in love with the terrarium. I cannot stand being stuck inside all winter long but if I had a terrarium, I think I could handle the cold months much more easily! Wow, I love the clean white rooms. I have very small rooms downstairs and have decorated them clean white walls. I have also dotted some pieces of mirrored furniture about,brightening the place up. I love it. Great post! !